In anticipation of this weekend’s Farm to Table Dinner at the school, today’s post was going to be about my first attempt at writing a recipe. 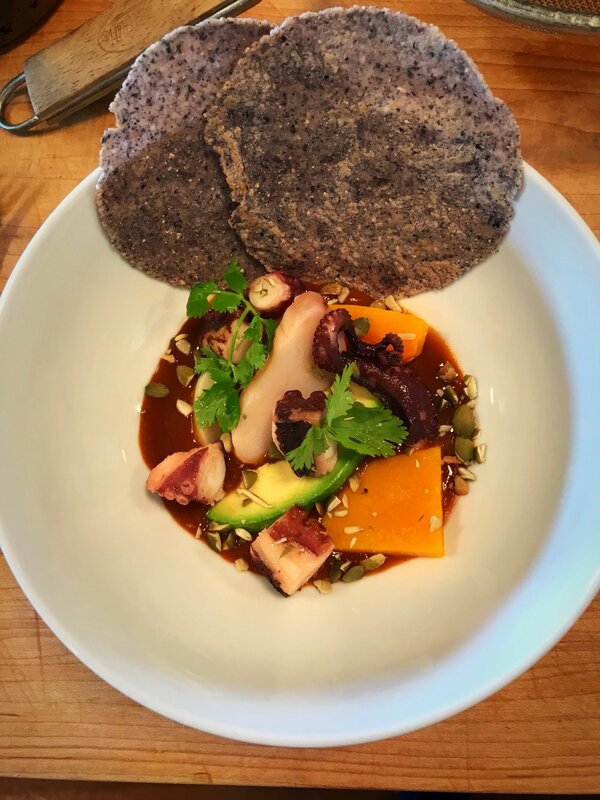 This post, I imagined (I’d decided to write this piece before trying to write a recipe) would be about the difficulties of conveying a dish in my head onto the plate and then translating that dish to words on a page. It still is a bit about this (and that process was even more difficult than I’d anticipated), but as I began to write I also realized I still have so much to learn about what makes for food people want to eat and, more importantly, what makes for food that people want to spend time cooking for themselves. The dish in question is Ouvo Raviolo with Kale Three Ways, the one I’d prepared for our late Summer Farm to Table dinner last month. An oversized ravioli, filled with a lemony kale ricotta and (ideally) perfectly runny egg yolk, in a kale sauce and with a kale breadcrumb on top. Needless to say the dish was very green, in both color and my sophomoric notions of “elevated” cooking (Is it three times as seasonal if you use an ingredient three times in the same dish?). It also happened to be pretty tasty in spite of my inexperience; pasta plus cheese plus breadcrumbs can have the tendency to do that. So I excitedly began to test and write the recipe for this delicious, if imperfect, dish. Immediately my initial expectations were proven correct: this was tough. I often cook pretty improvisationally and remembering to carefully measure each addition - down to the pinch of salt (though honestly, you’ll see I got lazy and included a lot of “salt to taste”s) - was a major obstacle. More significantly, it’s difficult to write a recipe for a dish you’re attempting for the first time. And even more so when the central technique - putting an egg yolk in a ravioli - is something you’ve never done before. That said, over the course of two testing days Ian and Shelley guided me through the A and B tests of broth (use water, not whey; definitely strain), and fillings (preserved lemon should go in everything). We time tested small batches until we’d simultaneously achieved a perfect runny yolk and al dente pasta. In short, we ate a lot of ravioli. Soon, something that resembled a working recipe began taking shape in notes scrawled across a scrap of brown paper bag covered in flour and kale sauce. Assemble charcuterie plates: Head Cheese, Pickles, and Sourdough. Open wine, fill glasses. Set another place at the table to accommodate one more guest (dig through newly wash laundry to find an extra napkin). Announce menu. Clear pickles. Plate Smoky Heirloom Tomato Soup, ignore that the bowls start to burn your hands only halfway to the table. Clear bowls. Plate Octopus Aguachile (‘octopus’ and ‘aguachile’ being just two of 15 components). Wash something. Refill water glasses. Clear aguachile. Cook 40 Raviolo perfectly (major thanks to Ian), plate and serve. (Note to self: practice carrying 3 and 4 plates at a time.) Worry that it’s too dark to see the food; realize we can’t do anything about it. If possible, pause for water and to grab a bite of any of the three prior courses. Refill water, redistribute silverware. Clear raviolo. Remove Pork Belly from wood-fired oven, plate, sauce, and serve. Clear. Plate dessert: Walnut Meringue with Raspberry and Prosecco Sauce. Breathe. Cleanup. It was a whirlwind. And so so much fun. An incredibly communal experience both as a team and with our guests, and the perfect celebration of summer’s end. At the end of the night, tables cleared, dishes done, and floor mopped, I needed only to grab my recipe notes before I could get some much needed rest and begin writing in the morning. Where were they? The kitchen was spotless. Not a crumb, let alone a scrap of paper. In the rush of service my recipe notes must have been thrown away. Square one. But not quite. Part II with recipe to come.